Every Friday, a manager at Edward-Elmhurst Health in the Chicago suburbs sends a list to the staff of around 35 drugs that are in short supply. They range the gamut—injectable anesthetics like lidocaine, antibiotics, eyedrops, sedatives, cardiac drugs, diuretics. But the most pressing shortage involves pre-filled injectable opioids like Dilaudid, fentanyl and morphine. They are used to sedate patients before surgery and manage pain after an operation as well as for trauma, burn or cancer patients. Twice a week, Edward-Elmhurst has internal pharmacy calls to get a handle on what product they have on hand, the latest news on suppliers and coordinate with clinicians to explore options. Managing shortages has been a regular practice over the past two years, said Phil Williams, associate vice president of pharmacy services at Edward-Elmhurst. "We have limited resources to begin with, so diverting resources to source product, develop alternatives and meet with physicians takes a significant amount of time," he said. "We are spending 40 to 60 hours a week just dealing with a myriad of shortages." While three-hospital Edward-Elmhurst hasn't had to delay or cancel surgeries, taking the time and spending the money to mitigate the shortages has made a significant dent in its budget. Without the necessary supply of injectable opioids, other providers have had to put off treatment, according to a survey from Premier, the group purchasing and consulting organization. 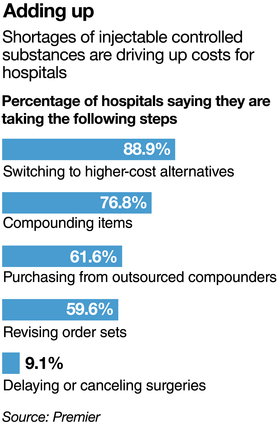 More than 96% of 116 of Premier's member health systems surveyed said they are experiencing moderate-to-severe shortages of injectable narcotic medications, a problem exacerbated by a manufacturing stoppage of their largest manufacturer, Pfizer. More than 57% reported that the shortage impacted patient care, including delaying or canceling surgeries or lowering patient satisfaction scores. The shortage and manufacturing delays are expected to last through the second quarter of 2019. The supply of injectable painkillers has been hamstrung as Pfizer continues to upgrade its McPherson facility in Kansas that produces the prefilled syringes. The upgrade has taken longer than expected and a third-party supplier ran into a technical issue, which has halted production. The plant was one of a number Pfizer added when it acquired Hospira in 2015 for approximately $17 billion. Pfizer said in a statement to Modern Healthcare that it is resolving the shortages as quickly as possible. Other companies can't make up the difference because they don't have the capacity. Even if they did, the Drug Enforcement Administration is unwilling to give them large amounts of raw materials. The DEA implements annual caps on the amount of raw material a manufacturer can use to make opioids—one mechanism it has to try to limit the diversion of the addictive drugs amid the addiction epidemic. The DEA has not shifted those caps to allow other manufacturers to produce enough to offset the shortage of injectable narcotics, according to Premier, which has advocated for the agency to loosen its quota restrictions. "We understand and support the DEA's goal to be judicious about the production of narcotics, but we believe we are in the midst of a public health crisis," Mike Alkire, chief operating officer of Premier, said in a statement. "A temporary reallocation of supply quotas would allow others to step into the void, potentially addressing a multi-year shortage in a matter of months." Injectable opioids aren't the ones getting diverted, said Scott Knoer, chief pharmacy officer at Cleveland Clinic. 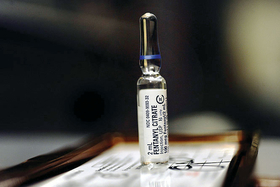 "We have to do something to try to limit controlled substances, but limiting injectable opioids is not helpful for patients who need them," he said. Systems have been able to work around the shortages by giving opioids to patients orally, for those who can swallow, and substituting opiates with muscle relaxants and other painkillers. But when providers have to scramble to find alternatives, they are more prone to making mistakes. While there is still a shortage of small-volume presentations of saline bags stemming from Hurricane Maria's tear through Puerto Rico that damaged a number of the island's manufacturing plants, that situation is improving. Many of the facilities have resumed production, and alternative sources including manufacturers in Mexico and Australia helped bolster supply. But Puerto Rico is home to more than 50 drug manufacturers, which are all in various stages of recovery. Also, there are other drugs that Baxter—the biggest supplier of saline bags—hasn't delivered, said Erin Fox, who directs University of Utah's drug information service. "Baxter continues to not deliver promised items—we are short on water, amino acids and dextrose solutions," she said. "Baxter's promised delivery of dextrose solution on Friday just didn't happen. This forced us to scramble over the weekend." Baxter said there may have been a disconnect between the University of Utah and its distributor, and that the products were delivered Monday. Consolidation among generic pharmaceutical manufacturers is partly to blame for the problems providers face. There are often one or two manufacturers of widely used generic drugs, and when production is disrupted it can have a broad downstream effect. Few providers consistently receive advance notification from the drug manufacturers, wholesalers, distributors, group purchasing organizations or the U.S. Food and Drug Administration about impending drug shortages. "We used to have five or six manufacturers for a particular product, now we are down to one or two," Williams said. "If there is a raw product issue or problem with the FDA, that throws a significant wrench in the entire supply chain." This is not a short-term problem, Williams said. "Manufacturers anticipate the (opioid injectable) shortage to be 'corrected' in March of next year," he said. "We are not finished with this yet by any means." Want to continue the conversation about opioids? Join Modern Healthcare on April 25-26 at its Opioid Crisis Symposium. An edited version of this story can also be found in Modern Healthcare's March 26 print edition.